Jesus: His Life is a new four week event, premiering today, Monday, March 25, on The History Channel. It explores the story of Jesus Christ through a unique lens: the people in his life who were closest to him. Each of the eight chapters is told from the perspective of different biblical figures, all of whom played a pivotal role in Jesus’ life including Joseph, John the Baptist, Mary Mother of Jesus, Caiaphas, Judas Iscariot, Pontius Pilate, Mary Magdalene and Peter. Each figure takes a turn guiding viewers through the emotional and epic story of the most famous man in history, through his birth, death and resurrection, all conveyed through a combination of scripted drama and interviews with prominent religious and historical experts. Utilizing some of the world’s most respected Biblical scholars, historians, faith leaders and theologians, the series weaves together the canonical Gospels, historical sources and cultural context to create a complete portrait of Jesus – the man and the Messiah. The series reveals his journey through a complex world of kings, politicians, reformers and soldiers in a turbulent power struggle during a time of revolutionary change. Jesus: His Life brings viewers into this dramatic world to reveal the greatest story ever told. The series premieres two episodes back-to-back weekly with the finale airing just before Easter. The series interviews and consulted with a diverse group of scholars, faith leaders and theologians from across the ideological spectrum to provide a rounded picture of the life and times in which Jesus lived. Risen caught up with Ben Witherington III who is the Professor of New Testament for Doctoral Studies at Asbury Theological Seminary to learn more. 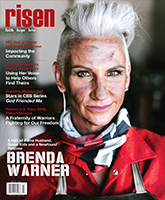 Risen Magazine: Will you share a little bit about your background? Ben Witherington III: I am a United Methodist minister and I teach at Asbury Theological seminary, which is an evangelical seminary in the Wesleyan tradition. I grew up in the Methodist church. I got very involved with InterVarsity when I was at Carolina. I then went to Gordon Conwell seminary and did my Ph.D. on women and their roles in the New Testament in England at the University of Durham. RM: Jesus is an important historical figure, but why you think it’s important for audiences to see this series? BW: This series is sort of at entry level. It’s intended to be user-friendly and to raise good questions about the life and person of Jesus while trying to appeal to the widest possible audience. We live in a culture that’s biblically illiterate. Almost anything can pass for knowledge of Jesus in America at this point. Right? So this is trying to help people raise their game and be better informed about Jesus and his disciples. RM: What are maybe a couple of key Biblical principles that you think America needs to embrace today? BW: That’s hard to say. There’s so much truth decay in America. I don’t know. We are far more tolerant of all kinds of immorality then we were when I was growing up. So, I think on one of the principles is freedom of religion and freedom of religious expression. The vast majority of Americans would affirm that. So I would say that ultimately comes from what the Bible says about faith and freedom. RM: The series series leads up into Easter, which is a time when a lot of people come back to church, or check it out for the first time. How can this maybe help them have a more meaningful experience? BW: I would say is this series is good at teasing the mind into active thought. Whether you’re a person that’s long-known who Jesus is or you’re just beginning to think about Jesus, this will be good. And there will be questions raised that even an experienced, or older, Christian might not have thought about, and that will tease their minds into active thought as well. So I think it’s beneficial for whatever level you’re able to plug into. But it’s couched in such a way that it doesn’t presume anything, really. It’s sort of from scratch. RM: In your line of work, teaching and researching, across the globe, what are you seeing as the temperament when it comes to the way people are responding to faith? BW: I would say that in Europe, in North America, the Judeo-Christian influence on the culture is generally waning rather than waxing. So getting less, not more. But in the other two thirds of the world, it’s a whole different ballgame. I spent time in Africa and India and the Orient, Christianity is growing leaps and bounds there. Russia would be another example as well. So I think we’re dealing with the situation that it wouldn’t be wise for us to judge what God is doing in the world from what’s happening just in North America right now.